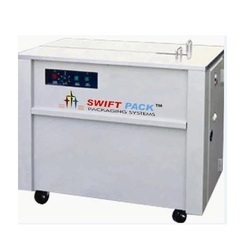 We are a leading Manufacturer of low table strapping machine, table top semi automatic strapping machine, fully automatic box strapping machine, sp-740h semi auto strapping machine, carton sealing and strapping machine and fully automatic strapping machine from Chennai, India. Low Table Strapping Machine is one of the strapping machines which delivers consistent performance in a constant production environment. The low table top strapping machines give the operating ease to put the package on, strap it and put it back on the other side. This type of machine allows strapping of many hard packages (eg. cartons) on less time a person would take. Therefore, this type of machine enables an increase in packaging speed and helps in the timely dispatch of consignment. Model-SP 101 is suitable for cartons, calcium-plastic cases, books, soft and hard packages as well as all kinds of articles in square, cylinder or annulations. The machine with a high table is suitable for general objects, while that with a table in middle height is suitable for those packages that are larger or heavier. 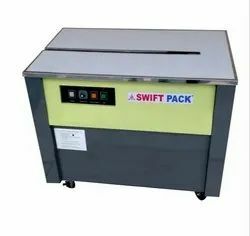 A strapping machine with a very low table is suitable for the packages that are very large or heavy. 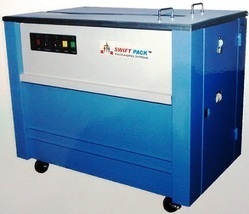 This machine is used for dispensing, tightening and sealing straps around package. After the strap tightens around the package, it automatically ends with a secure heat weld. What makes this fully semi automatic strapping machine different is its speed, user-friendly controls, portability, and last but not the least its cost. One can easily avail this type of machine from us, contact us today. As soon as we receive the order, we make it a priority and execute production process 24/7 and provide minimum turnarounds. Shri Vinayak Packaging Machine Pvt. Ltd. is designing, manufacturing and marketing the Fully Automatic Strapping Machine (online version), which is a standardized model having power roller table which is beneficial for assorted strapping purposes in the packaging industry. It features rust resistance, and sturdy, rugged design, which enhances the durability of the machinery. The brush guiding mechanism of Online Fully Automatic Strapping Machine is very helpful in strapping the exact position. All its parts and components are avant-garde and easily operational, which means that no regular greasing is required; hence the requirement of maintenance is minimum. We use the best material and alloys to fabricate the machine. Also, the latest production technology is used by us which gives marvelous results, owing to its innovativeness and research orientation. Owing to new research technologies, this online version of the strapping machine can be used in combination with other machinery/equipment; although this stand-alone model is self-sufficient enough to deliver desired packaging results. Depending on the variety of boxes, the strapping settings can be adjusted. Helps in par-excellence and stellar packaging, owing to excellent strapping. Its tension can be adjusted as per the requirements. The material of construction is aluminum alloy and others. Efficient, 24 hrs uninterrupted operation is assured. The company designs and develop the number of semi-automatic strapping machine, available in different standards, from regular to deluxe. This machine stands on movable wheels, which makes it portable and can be placed to any place according to the convenience. It has buttons, the operator can operate this machine with a single or multiple clicks. If you also want to improve your production rate and want to provide minimum turnarounds to clients, this automatic strapping machine deluxe will save you the time of manual strapping. We offer a wide range of Carton Sealing and Strapping Machine. These are made up of good quality material. Our company employs a team of engineers, having expertise and experience in manufacturing fully automatic strapping machines. The specialties of this horizontally oriented machine are its compactness, easy mobility, energy saving mode, which triggers after 2 min when it is not in use, also it has 20 seconds of the warm-up period and quiet intermittent action control. With the work table height of 830 mm, it is possible for the operator to easily operate. The fully strapping machines are fabricated using high-grade electrical components and the machine is covered in the stainless steel frame. Fully Automatic Strapping Machine is suitable for general objects. This machine is equipped with rollers to ensure strapping can be achieved with less force. The fully automatic strapping machine can be used in a production line of which objects differ in size and irregular in shape, and it can achieve unmanned strapping together with power conveyor. 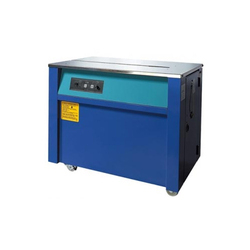 Power belt table top and the access transmission mechanism are adopted, with easy maintenance. The fully automatic strapping machine is widely used to strap various packages (except annulations) in all kinds of fields. It can be a single-unit operation or equipped onto the production line. 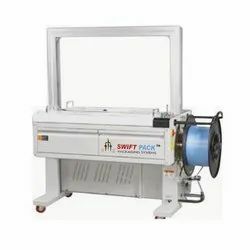 Economical choice for limited strapping usage, bottom seal Semi Automatic Strapping Machine now offers you a simple option to apply packaging load securement with low maintenance costs and ease of operation, designed for all general industrial applications. This close-type frame with innovative clutch cams transmission can help you pack/secure your packages firmly and properly. Using polypropylene strap, this banding equipment which owns its aesthetic design and easy-to-operation characteristic is suitable for offices and shops. Manufactured in Taiwan, this semi-auto strapping machines provides you the best packaging experience. SP306H Semiautomatic Strapping Machine- Feather Touch Model is widely used in various fields such as light industry, foodstuffs, foreign trade, and printing. Our Deluxe Model Semi Automatic Strapping Machine stands out because of its proper functioning. This machine stands on movable wheels, which makes it portable and can be placed in any place according to the convenience. It has buttons, the operator can operate this machine with a single or multiple clicks. Semi-Automatic Strapping Machine is one of the strapping machines which delivers consistent performance in a constant production environment. The Semi-Automatic Strapping Machine gives the operating ease to put the package on, strap it and put it back on the other side. This type of machine allows strapping of many hard packages (eg. cartons) on less time a person would take. Therefore, this type of machine enables an increase in packaging speed and helps in the timely dispatch of consignment. Backed by the technological expertise of professionals and our vast domain experience, we are offering Semi Automatic Carton Strapping Machine to our clients. 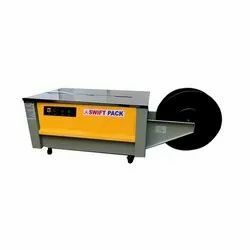 We are offering Heavy Duty Low Table Strapping Machine. 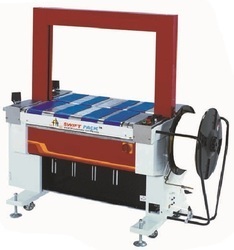 We are offering Low Table Semi Automatic Strapping Machine.